This is a Convent that was fully refurbished and reconstructed located right in the center of the city of Leon. We had spent a lot of time traveling by car when we finally arrived to the hotel and immediately started loving it. 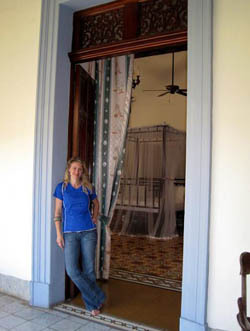 The first thing was the great welcome that the El Convento staff gave us. They truly simplified your lives. Then we got to our room and loved it. It was large, had two queen size beds, & lost of space to place my baby’s portable crib comfortably. Another great point, which I always chalk up to a must need is a bathtub. With 2 kids, 7 and 1 year old, it’s way easier to throw them in a tub and do a quick bath. The hotel has wide corridors are decorated with antiques from Nicaragua, Honduras and El Salvador. The lobby is really beautiful with its high ceiling, huge alter & sitting area. This is a great place for traveling families! Granada is Nicaragua’s colonial gem! So to travel in style to such a stylish town I had the luck to find La Bocona hotel! One thing that struck me most was the friendliness of the staff. I was up at 6 am as the cook and her assistant arrived. They came to work all smiles and ready to help. About the room all I have to say is: Wow Times 10! We were all speechless when we first opened the door and looked inside! 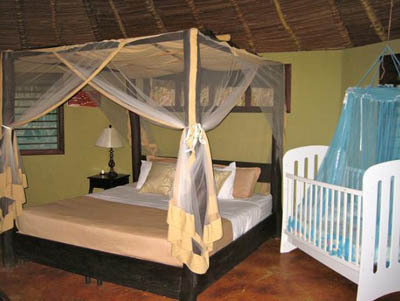 We had stayed in many deluxe rooms before but the immense grandeur of this one was amazing! The room itself was 1400 square feet. The ceiling was so high it added to the immensity of the room. I also loved the fact that I could lounge out in the number of over-sized, couches that are placed all over around the hotel as I watched my boy play in the pool & still be close enough to the room where my 1 year old was napping. Plus they actually give 50% of their revenue to: Carita Feliz, a local center for young people promoting health and education. Did you know that Ometepe Island is the largest fresh water island in the world & the only freshwater island in the world with TWO volcanoes on it? You can guess what a spectacular place it is for travelers. We stayed at Totoco Eco Lodge which is a true eco-lodge with insane views, delicious food and a pool for my son, it really made the trip extra special. The goal of its founders is to Pioneer and share best practices in eco-tourism as they stimulate and support the sustainable development of the local community. 1. Eco Lodge – They offer luxurious & comfortable cabins set on its own garden with a porch and amazing views of the Concepcion volcano and Nicaragua Lake. All the materials used to build the cabins were locally grown and obtained, while hiring and working with the local community. 2. Organic Farm and Delicious Produce – On our entire trip around Nicaragua, Totoco Lodge was the only place where organic products were offered. You can take a fun tour of the farm and property to really learn all about the workings behind the scenes. It is a great educational tour for kids to understand the difference & importance of organic products. 3. Development Center and Local Community Involvement – The Totoco Foundation is fully involved with helping local people to get education because most of them don’t even get to fourth grade. Some of them are even learning English. As you can see all of the hotels are in different areas so if you come to Nicaragua and stop by any of them give these hotels a chance. You won’t be disappointed. Marina K. Villatoro is an expat living in Central America for over 10 years. She travels with her family in Central America. Connect with her on twitter and facebook.